Have House Sparrows Invaded Your Bird House? A few dozen English House Sparrows were imported to North America in the 1850s. Just thirty years later, House Sparrows were already being considered a serious pest to agriculture and to native species of birds. By 1900, House Sparrows could be found in most of the continental US. How did that happen so fast? House Sparrows are fierce competitors and vigorous colonizers. Because they don’t migrate, they nest early; beating out native songbirds to your bird houses. In one season, a pair will raise up to four broods of five, making—count them—TWENTY new House Sparrows. 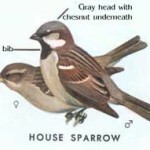 How to identify male and female House Sparrows. Illustration from Sialis.org. For help in identifying male or female English House Sparrows and their eggs, see Cornell Lab’s Sparrow reference page here. House Sparrows will evict other species attempting to nest in their territory, by destroying eggs, killing nestlings, or even killing females that are incubating eggs. A male House Sparrow is more bonded with his nest site than his mate and will fiercely defend the nest and a small vicinity around it. House Sparrows must be discouraged from breeding in your nest boxes, otherwise they will only continue to rapidly increase and threaten our native species. So, what to do? Because these birds are non-native, laws governing trapping and interference with breeding do not apply to them, as they do to our native species. The decision is up to you when choosing strategy and tactics. Any larger and unwanted species could invade! If the entry is larger than 1.25″, we recommend a hole reducer. Ask us at the store for your best options. We recommend these two Bluebird houses as being most resistant to House Sparrows, Gilbertson Bluebird Nest Box and Bluebird Slot Nest Box. Use quality food preferred by your desired tenants. Many native birds are attracted to Black Oil Sunflower Seeds, while House Sparrows are not. Inferior quality birdseed blends are bulked out with grains like milo, millet, or cracked corn that House Sparrows enjoy. (Find out why bargain seed blends aren’t such a bargain, for you or your backyard birds: ‘Quality Seed & Clean Feeders Matter’ and a menu for maximizing wild bird nutrition). Remove House Sparrow nests and eggs. Don’t throw the nests on the ground, the same birds will just use it to build a new nest! They rebuild nests very quickly, but don’t let this defeat you. If necessary, keep the door or roof open to really discourage them. Keep monitoring. Check your Bluebird boxes often! A House Sparrow on the box roof is not a good sign! Be diligent and investigate. Trap House Sparrows that have taken over nest boxes. Some people take drastic measures and choose to destroy the invaders. Others advocate trapping and relocating, but this only creates a problem elsewhere. Please be considerate of other backyards and agricultural areas if you choose to relocate. Take them into a busy city, not a city residential neighborhood. House Sparrows are urban birds! 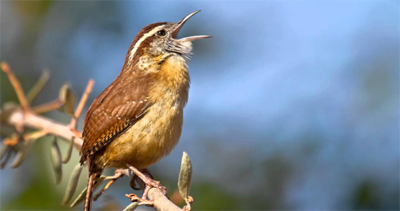 They will hang out around humans and won’t disturb other native birds who nest in residential areas. The Cornell Lab ‘Nest Watch’ has a more detailed list of strategies. Sialis.org has extensive information on both passive and active control tactics, and also a list of actions that do not work! The North American Bluebird Society’s Factsheet suggests ways to protect Bluebird Nests.